The camping season is almost upon us, so why not get all your camping gear ready now and spread the cost. 24ace have a fantastic range of Gelert Camping Equipment, including a Double Burner Gas Stove and Grill, a double folding camping table, an adonised aluminium cook set, sleeping pods, and a range of tents. 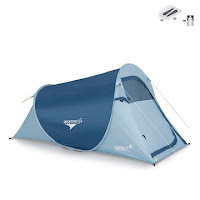 This Gelert Quick Pitch Tent is ideal for those who find pitching a tent a daunting task. It pitches in seconds, providing instant cover from the elements.